Logitech has made wireless mice for notebooks for a while now, but now it brings laser technology into the mini-arena with the V450 Laser Cordless Mouse for Notebooks. There's a tiny USB receiver stored inside, and it also has that Tilt Wheel Plus Zoom, for semi-useful side-to-side scrolling. 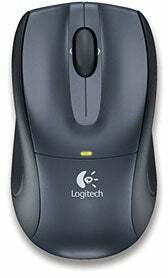 One of these days there will be a wireless mouse that's the equal of its corded brethren, but Logitech has come the closest so far. Its notebook mice are plenty small, but we're thinking that the slightly reduced suitcase space required by one of these mice is not worth the sacrifice in comfort or efficiency. But that's just us. It'll retail in July for around $50, much less on the street.